A very common question here in Disk Detective is, hey, is that a planet? A disk? A moon? Those are exciting things to think about. Let me skip to the punch line: no, sadly, we can’t see planets, disks, or moons in the Disk Detective images. But let’s talk more about distances and angles, and I’ll try to better explain what we can and can’t see. (If you need a refresher on what an arcsecond is, try this post from another site.) The overlays aren’t the only thing with angular scales that are important here. The original pixels in the DSS are about 1.7 arcseconds; the pixels in 2MASS are about 1 arcsecond, and the pixels in WISE are about 1.4 arcseconds. OK, so physically, what do all of these angles mean? We could start with something at least somewhat familiar — the Moon is about half a degree in diameter, or about 30 arcminutes. Here is a post from another site that has lots more good information tying angles on the sky to familiar objects (like your finger). Now, let’s start applying these ideas. The stars that are in Disk Detective appear to be relatively large on the screen. But are they really that large on the sky? Proxima Centauri, the closest star to the Sun, is about 4.2 light years away. In 2002, the VLT measured the diameter of this star to be “1.02 ± 0.08 milliarcsec, or about the size of an astronaut on the surface of the Moon as seen from the Earth (or a head of a pin on the surface of the Earth, as seen from the International Space Station).” (quote is from the press release in the link.) Let me emphasize this: MILLIarcseconds, so about 0.001 arcsecond. The Disk Detective crosshairs are 2.1 arcsec, and the pixels in those images are between 1 and about 2 arcseconds. Proxima Cen is the closest star to us, and it is a fraction of a fraction of a pixel in the Disk Detective images. We can’t typically determine sizes of other stars with most of our current instrumentation. The only people who can get the sizes of other stars right now are people who use optical or infrared interferometers, and only for targets that are relatively close and relatively bright. So the stars in Disk Detective only appear to be measurably large on the image, because of the way that the telescope+detector responds to the source of light. Let’s go further, and put an imaginary disk around Proxima Cen that is the size of our Kuiper Belt. Making some simple assumptions, I get that it would be about 30 arcseconds across, so half the size of the Disk Detective image. But it would be impossibly faint at all of these bands, very difficult to see in these relatively shallow images (by which I mean ‘short exposure time’ such that we only see the brighter things). And we are still working with just the very closest star. A relatively nearby star with a real (not imaginary) disk is Beta Pictoris, at about 65 light years away. This star is also impossibly small compared to the pixels here. Its disk, though, is ENORMOUS, 5 times larger than our Solar System. I get that it is about 102 arcseconds across, larger(!) than our Disk Detective images. BUT, it too would be impossibly faint, very difficult to see in these relatively shallow images, and in fact unless you found a way to block the light from the central star, it would be impossible to find the disk. This is what astronomers really do – we have a special shade that blocks out the light from the central star so that we can stare for a long time and collect light just from the disk. Planets (or Moons for that matter) are far, far fainter than the disk, and we still need to block the light from the central star (and make some good wavelength choices to maximize the brightness of the planet compared to the star/disk). Even when we do that, though, one of the planets found in Beta Pic’s disk is 0.4 arcseconds away from Beta Pic. …Aaaaand, now, we’re back to fractions of pixels in Disk Detective, even if we could block the light from the central star. And it gets worse! There is this blog post on issues of spatial resolution in Disk Detective. The WISE spatial resolution is ~6 arcseconds. SIX ARCSECONDS. When you get to 22 microns, it’s TWELVE ARCSECONDS. That means that if two things are 12 arcseconds or less, WISE at 22 microns can’t tell that there are 2 objects. (That’s why we ask you in Disk Detective to indicate if you are seeing 2 objects in the shorter wavelength images.) The rest of WISE can’t tell if there are two objects that are 6 arcseconds or less apart. The spatial resolution of the DSS and 2MASS is closer to 2 arcseconds. So pixel size is rapidly overtaken by spatial resolution issues at the longest wavelengths, where the disk is brightest. At 25 light years, Fomalhaut is another relatively nearby star that has a disk. The Herschel observatory snapped a picture of it, but its eyesight (at longer wavelengths) is about 3-4x better than WISE at 22 microns. The dust’s light is also dependent on its temperature–cold dust will glow more brightly at longer wavelengths. Dust that is bright at 22 microns is typically much closer to a star. Even in the most optimistic case where you have a bright extended disk like Fomalhaut, it would barely peek out from behind the edges of the WISE “blob” (the response of WISE to the light from the unimaginably small point of light that is the star), shown in the upper left hand corner of the figure–the pictures of Fomalhaut as it looks at 25 light years and 160 light years are shown on the lower right of the figure, to scale on the sky with the WISE 22 micron PSF. See? Waaaay too small to be seen with WISE. And, at 160 light years, too small for Herschel too. What might WISE see with Fomalhaut? 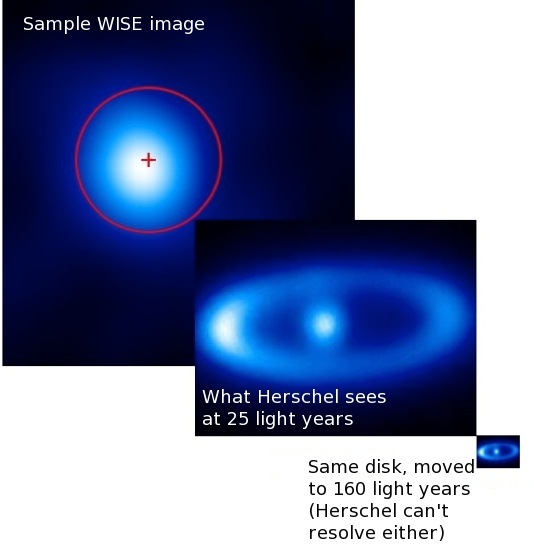 Using a rough model of the Fomalhaut disk and smearing it out with the WISE PSF, it might look like this, provided the entire disk was just as bright as the central star at 22 microns. BUT that is not really the case for Fomalhaut–the disk is at least ~40x fainter than the star at that wavelength. And it gets worse – most of the emission from Fomalhaut at about 24 microns does indeed come from a cloud close to the star; that part is 10x brighter than the total outer disk flux, but that’s still much fainter than the star. But, wait, you say, you know you have seen pretty pictures of disks before in the media! Well, sometimes those are artist’s conceptions, where we are inferring the presence of disks from the excess of emission in the IR (“more IR than we think there should be”). Sometimes they are models of what people think these things must look like. None of the gorgeous images are from DSS, 2MASS, or WISE. And, yes, there are four famous disks that are nearby: Vega, Fomalhaut, β Pic, and ɛ Eri. Nearly all of the great images are of these four. There are another 8 debris disks that are further away than these closest four, but close enough that we stand a chance of getting images of them, so you may also have seen images of one of these 8. But there are only a total of 40 or so debris disks that are close enough that our current instrumentation can distinguish a disk from the central star, and sometimes it’s just barely distinguished, even when using the best tools available. And, especially then, it sure doesn’t look like a ring. Distances to these objects matter, a LOT. The overwhelming majority of stars in Disk Detective are much, much further away than these 4, 12, or even 40 closest debris disks. The closest ones in Disk Detective are most likely at the very best 300 LY away. Even if we put a Kuiper Belt around such a star, it would be less than half a pixel across. Even if we put an ENORMOUS disk, like Beta Pic’s, around such a star, it would be about 2 arcseconds across, comparable to the size of a pixel in Disk Detective (and still impossibly faint compared to the brightness of the star). Remember that planets or moons are far, far, far fainter than the disk, and usually closer in than the full extent of the disk. So there is just no way that we can see planets or moons in the Disk Detective data. If you find something that appears in the images of a target you’re looking at, and it is beyond the radius of the red circle, how far would it be from any given target? The circle is at 10.5 arcsec, and most of the questions I’ve seen on this topic are finding objects outside of that circle radius, so let’s call it about 20 arcsec. In the best case of our target being a star (1st assumption) that is 300 LY away (2nd assumption), and that the second thing is also a star (3rd assumption) at the same distance (4th assumption), that second thing is 0.03 light years away from the target object, or 45 times the size of our Solar System. That’s not a reasonable size for a disk around a star, much less a planet. And this is the best possible case, for the closest star in Disk Detective — most of the stars are much further away. Disks and rings are MUCH smaller in size than the smallest detail that WISE can see at long wavelengths. Every known circumstellar disk is unresolved with WISE, including Beta Pic and the other 11 of the closest stars with disks. And if we can’t see rings or planets around these stars, we certainly can’t see moons around the planets, which are generally smaller than the planets. For example, the Earth’s moon is just about the size of the state of Texas–much smaller than the Earth. The other objects that appear in the Disk Detective images, even within the circle, are other stars or galaxies that just happen to appear in the images. The chances of them being associated with each other (even as a binary star system) are extremely, extremely low. And they are not planets or moons around these stars. Lots of people want to image disks and planets, though, and lots of people, especially at NASA, are working towards that goal. We are looking for new disks all the time, and using existing instrumentation where we can to image disks. But to get lots more images of lots more disks, we need special instrumentation (much of which is still being designed, including at NASA), we need to be observing at the right wavelength (e.g., pick one at which the disk or planet is likely to be as bright as possible), and have the star+disk be close enough to us that we can resolve it. The limits for “close enough” are moving out further and further every year as we develop more and better instruments to look for these things. I wonder how good angular separation would be required to resolve that planet called WD 0806-661 b from its host star. Well, looking at the Wikipedia page (http://en.wikipedia.org/wiki/WD_0806-661), it says there that the system is a WD plus brown dwarf companion, and that the companion is 2 arcminutes away from the primary. Going to the original paper, it says 130 arcseconds (which is indeed close to 2 arcminutes). So, this would not take very high spatial resolution to separate them. However, what’s a bigger deal is that the source itself (the brown dwarf) is just 2 arcseconds away from a (e.g., has a a chance superposition with a) background galaxy. So in this case, you wouldn’t need a telescope with better than 2 arcminute resolution, but better than 2 arcsecond resolution, just in order to distinguish it from the background object! I wonder why is WD 0806-661 b called a brown dwarf while HD 106906 b is called a planet despite HD 106906 b having higher mass. I wonder what’s an angular separation of human’s eye. Angular *separation* would mean how far apart a set of eyes are. That depends on how close you are to the eyes in question – the farther away you are, the closer together the set of eyes would appear to be. What I think you meant, though, is the angular *resolution* of a human eye, meaning how small an angle you can see, or how close two objects have to be before you can’t see them any more as two objects. Googling suggests about an arcminute, but it varies from person to person. I’m nearsighted, so even with glasses, stuff is slightly blurry at a distance!